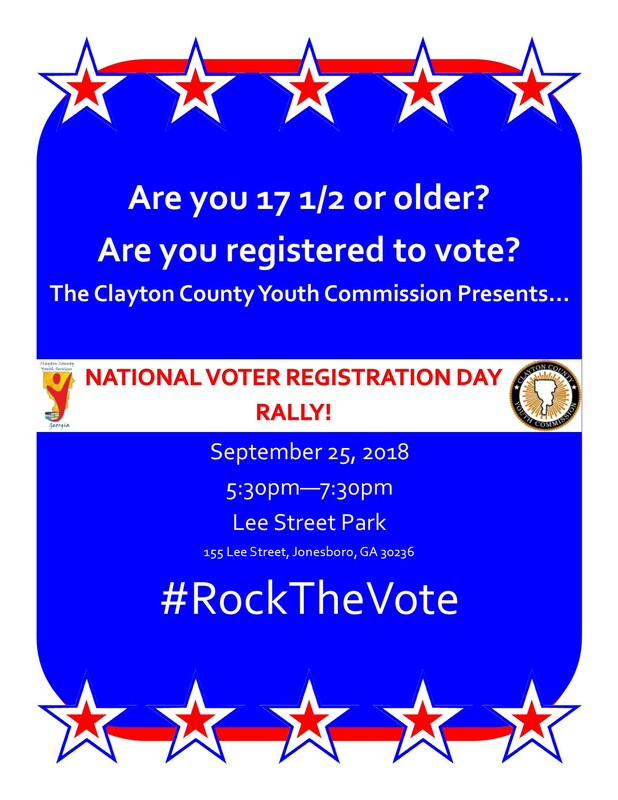 What: The Clayton County Youth Commission will be targeting youth at least 17 1/2 to register them to vote. There will be a live DJ and activities for participants. Why: The Clayton County Youth Commission is dedicated to civic engagement and educating youth in the voting process. The goal is to have as many youth registered to vote for the upcoming election and to encourage their friends to do the same. This will also be an opportunity to invite youth to the Teen Voter Education Forum on September 29, 2018 from 10am - 2pm at Carl Rhodenizer Recreation Center (3499 Rex Road, Rex, GA 30273) where youth will learn about government at the local, state and federal level as well as have another opportunity to register to vote.